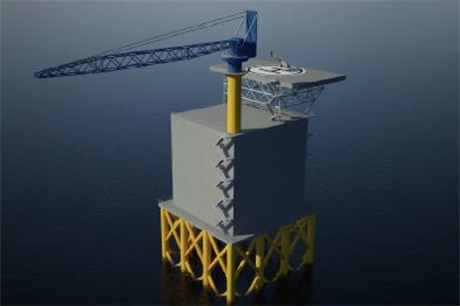 UK: Forewind, the developer behind the 2.4GW offshore wind site at Dogger Bank Creyke Beck, plans to build up to four offshore accommodation or helicopter platforms in the UK's North Sea. The platforms are intended to be bases for offshore construction, operation and maintenance and decommissioning activities for the first phase of development of the Dogger Bank Round 3 zone comprising of two 1.2GW offshore wind plants – Dogger Bank Creyke Beck A and B, 131 kilometres off England’s Yorkshire coast. Plans show a structure 125 metres long and 100 metres wide, with a seabed footprint of 12,500 square metres – similar to offshore converter platforms. The platforms may include large-scale accommodation and logistics capabilities such as communication systems and control hub facilities as well as a helicopter landing site. The accommodation bases will be used by staff working shifts lasting around two weeks on and two weeks off, rather than as long-term residents. The foundations being considered include gravity base and multi-leg. The accommodation platforms could act as a central offshore operations hub similar to offshore support or accommodation vessels and they could be a base for crew transfer vessels. Forewind is ultimately aiming for an installed capacity of up to 9GW at the Dogger Bank zone. The Planning Inspectorate accepted for examination Forewind's application for the first phase of development of the Dogger Bank zone on 25 September, which it hopes will be online by 2019.